TAWR 2017 Replay from Chris Jackson on Vimeo. 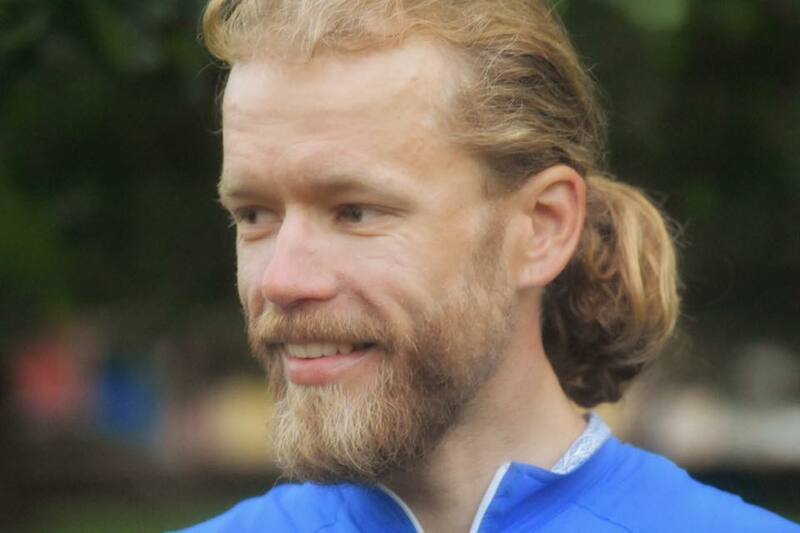 It was, after all, my first ever ultra endurance cycle race and I managed to stay in the top ten for most of it and was holding 7th place when I stopped. This was a better result than I ever really hoped for and added to that I’d thoroughly enjoyed the race, foul weather and all. 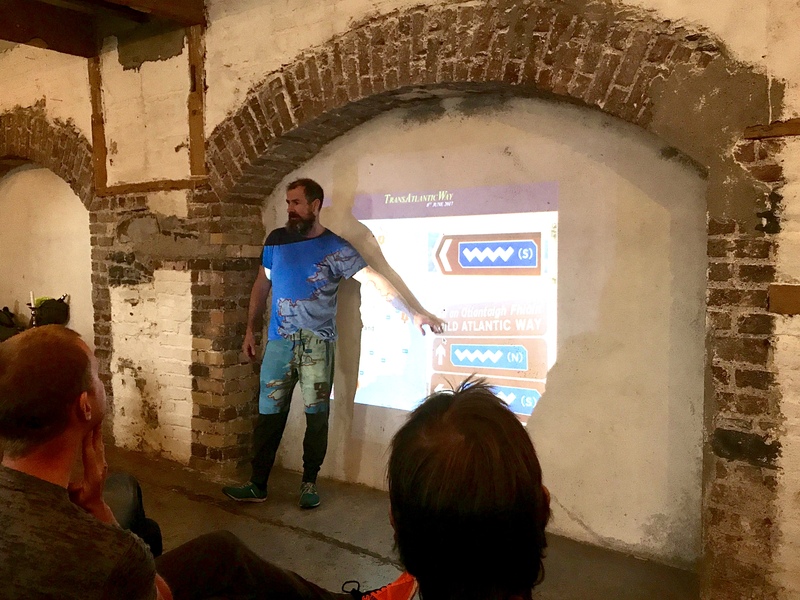 Race briefing was held on the Wednesday night before the start with event organiser Adrian O’sullivan regaling us in his own inimitable style; he claimed to be shy yet seemed rather at home in the spotlight. 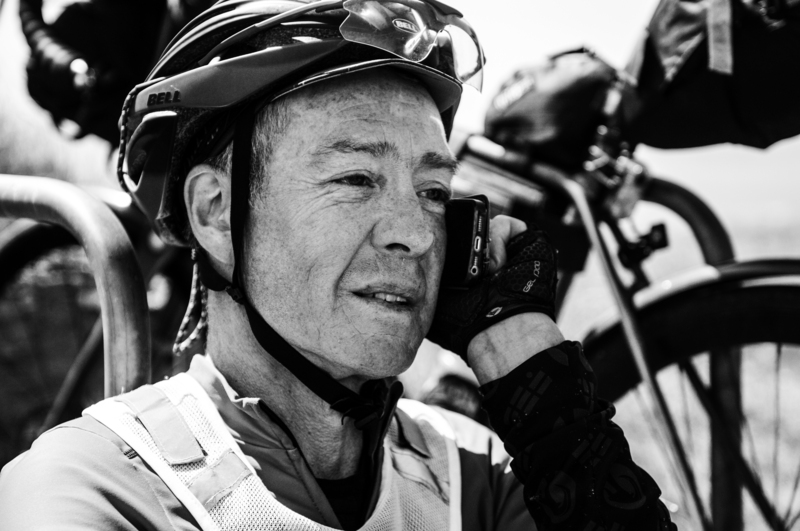 The crux of the briefing was that this was indeed an unsupported race, as billed, and that whilst his phone number is printed on our brevet cards it is only there for emergencies – don’t ring it! Other than that; follow the official .gpx route exactly, be responsible, conduct yourself with honour, stay safe, ‘nough said! I signed up for this race late in September 2016 and had been training, planning, dreaming, thinking about it for over 8 months. I was ready for the start, I could do no more, so let it begin! Finally Thursday 8 June 2017 had arrived. The start was scheduled for 10:00am with around 90 riders. 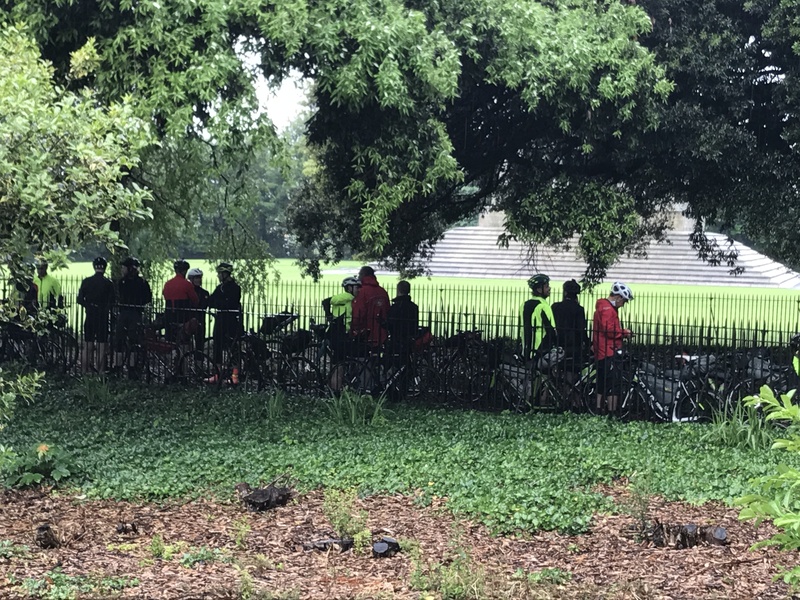 Rain was in the air as we gathered for shelter under the trees close to the new start location at the Wellington Monument in Phoenix park Dublin. 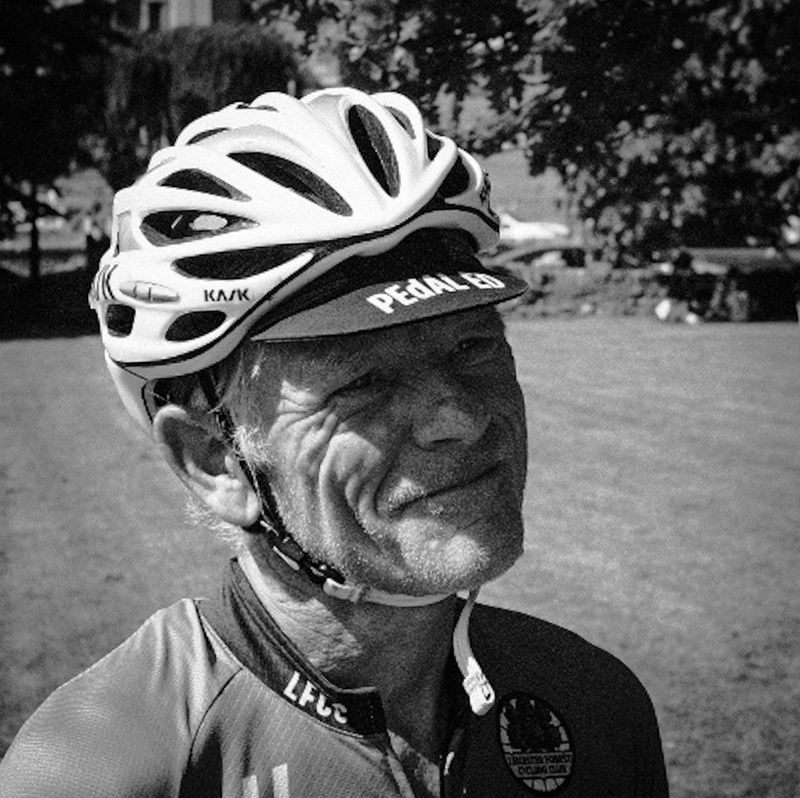 The mood was friendly and cheerful but tinged with mild trepidation as we chatted and admired each others bikes. Finally, somewhat after 10:00, we began! Adrian had made a late decision to move the start location due to the increase in rider numbers in this, the second run of the event and as a result there was to be a non competitive lead out to the main route start at the N2 road out of Dublin. 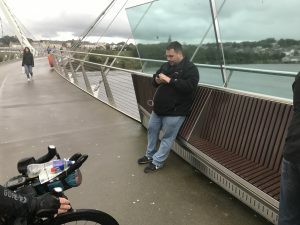 We would then follow the routes we had each planned to take us to checkpoint #1 in Derry and from there follow the compulsory route to checkpoint #2 in Kinsale. 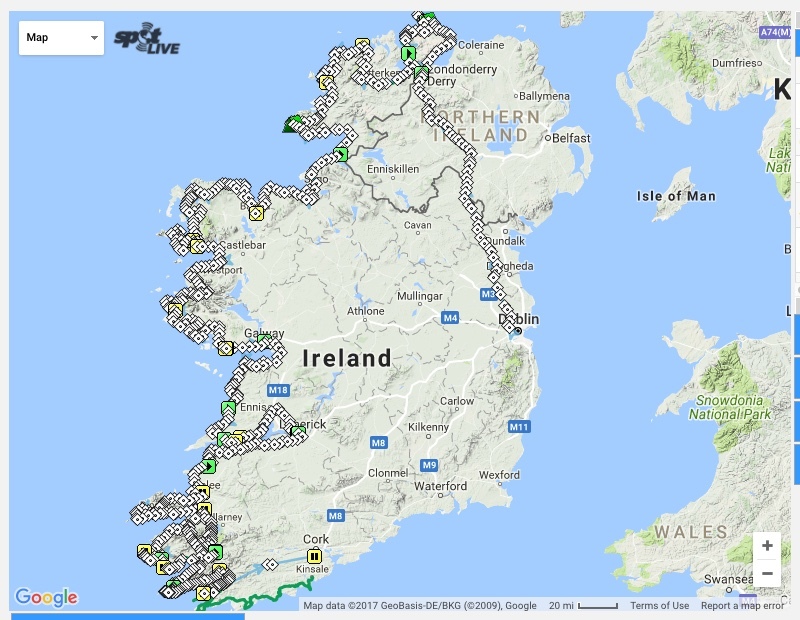 Then from Kinsale to the finish in Cork we could follow our own routes. Adrian suggested that those genuinely treating this as a race might want to head to the front of this lead out….so began a rush. I intended to race and gently moved through the pack towards the front as we headed off. Even now we were rolling the race still hadn’t actually really begun which only added to my sense of anticipation; I felt the excitement build… finally, finally, it’s on! 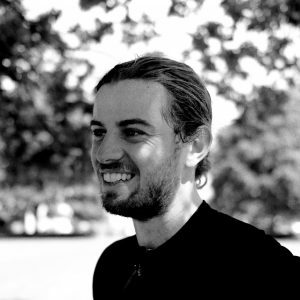 My plan for day #1 was to ride reasonably strongly, to make the most of my fresh condition, but not to overdo it in my enthusiasm and pay for it later. I had a target destination some 300km+ away but had no clear idea of how I’d pace against the other riders. I’m something of a loner when it comes to cycling so have few useful points of reference with regard to my speed relative to others. This ride up to Derry was when I first got an inkling that I might be respectably quick as I past many other riders without having to push too hard. Many of these initial place changes were short lived due to red traffic lights and road work stoppages allowing those you’d recently overtaken to quickly catch you back up. We were soon out into rural Ireland and making rapid progress on some fast roads. My gps, some hours in, was showing an average speed just shy of 30kph which is faster than I ever average when riding in my home county of Cornwall. My final average for the nine hours moving time it took me to get to Derry was still a respecable 26kph which shows how relatively flat this first leg is. I don’t recall when the real rain began but I took this photo of the brooding sky at Dungannon NI at 17:30 and suspect it was between showers. We had some truly torrential rain for much of this ride; it was bordering on comical. 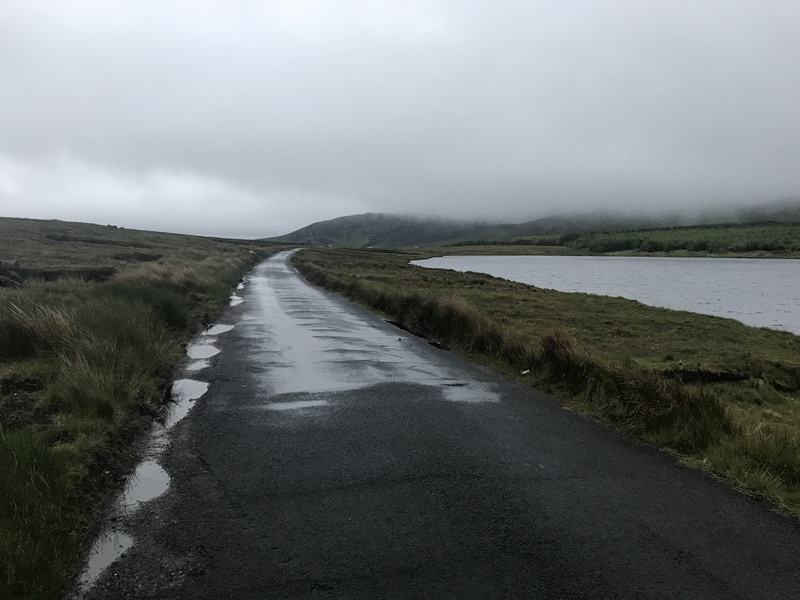 I actually enjoy cycling in the rain, it adds a sense of adventure and there is a kind rebelliousness to it that appeals; rain does not stop play. Equipped with decent wet weather clothing and equipment we need not fear the wet. I was up and off again at 04:30 but had dropped back to around 18th as many riders had ridden past me overnight. 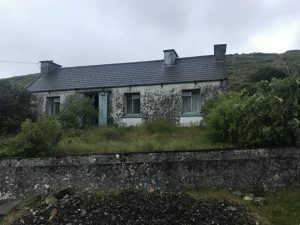 I met some of these as I approached and headed round the Malin head loop and heard tales of poor, damp, short sleeps and felt encouraged that I probably had a good rest advantage compared to some. I began regularly meeting up with the ever smiling Gerald Herradura from the Philippines. He’d whizz by me with a smile but then I’d inexplicably catch up with him again down the road. This pattern repeated for some days. Next up the Mamore Gap, the first of the 5 TAW2017 Mike Hall King Of The Mountains Challenge climbs and as I paused for a photo and to re-group Gerald once again materialised with a grin and shot off up the hill. I’d better get cracking then… Sure enough I met him again pausing part way up and took that as a perfect excuse to do the same, it’s a relentless climb and I had no big hopes for cracking a decent challenge time as I’ve seen lighter people fly by me up hills and there are many fast light people in this race. No, I wanted to maintain endurance levels and skip any hill challenge heroics. I don’t recall how Gerald and I came to part company from this point on but once again I met him some way ahead at the start of the gravel section at Glenveagh National Park. 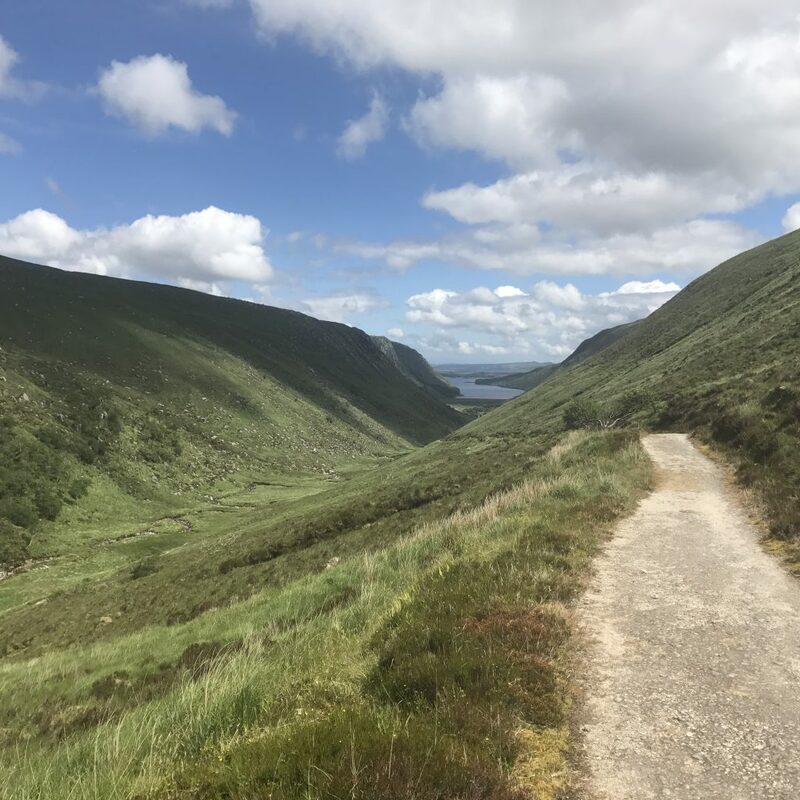 The sun was shining and the view simply glorious..
Todays target for my planned 8 day finish was Glencolumbkille which was looking plenty achievable and I managed to continue further on past. Foul weather with a strong northwesterly wind was forecast for later and I planned to ride at least until it arrived. After Glencolumbkille, near Malin Beg, there are some strong climbs that take you high up onto very exposed moorland terrain. The forecasted weather arrived and I found myself very exposed and ploughing headlong into a cold and vicious headwind in failing light. I wanted to find shelter, rather than waste my energy fighting this at night. 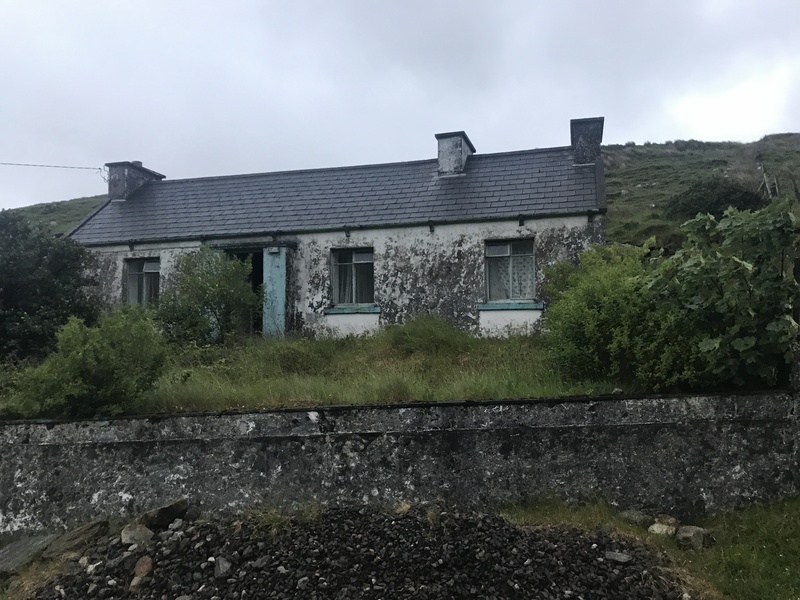 Once again a serendipitous bivi find materialised in the shape of and an abandoned house. Although moody looking it had a happy feel. That’s my bedroom on the right, dry, sheltered from the howling weather outside and complete with curtains. Who needs B&B’s! (Wet wipes plus bathroom breaks at shopping stops keep essential cleanliness needs well managed) A replay on Trackleaders shows me placed a creditable 11th as I began day 3 at 05:25 and with the worst of the nights weather past. Day 3 and destination Mulranny, some 344km away. The terrain, though still hilly, is flatter along this stretch of the route and I’d set myself greater distances in anticipation of swifter progress. The nights northwesterly winds were set to giveaway to strong to gale force southwesterly winds for the next few days complete with longer periods of rain and squally showers. Time for the Wild Atlantic Way to deliver on it’s wild name! The day began moodily enough with low sodden clouds, wet roads and increasing winds. I don’t recall a great deal about this day other than indulging in the luxury of a relaxed full Irish breakfast in Ballyshannon. I felt I needed it in order to properly prepare for the long day ahead. What I do recall is that this was a day of mixed weather and relentless headwinds with much time spent in the aero bars. I made decent progress nonetheless, maintaining a steady all day pace without overly fighting the headwinds. 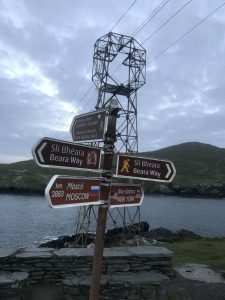 I had Mulranny down as a target for the day but what I had not realised was that the route takes you out around Achill Island before you pass through Mulranny so I was actually only heading close to Mulranny rather than to the town itself. This meant that late that night I was climbing hills in the pitch black expecting the glow of an up coming town to brighten the night sky and spur me on but that never happened even though my gps suggested I was nearly there. Finally I studied the route more closely and the penny dropped…ah that’s ok then. 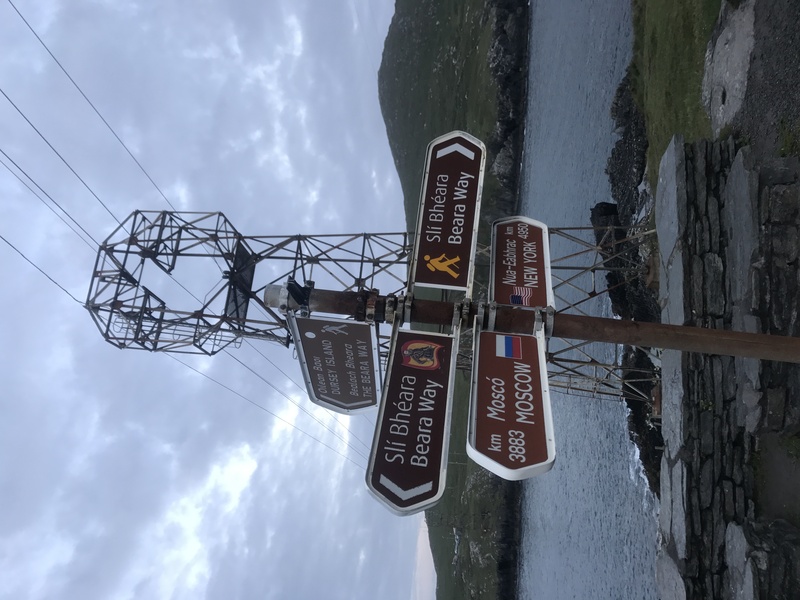 I finally made it to the junction for the Mulranny turn and headed right for Achill Island and began my search for the nights bivi. 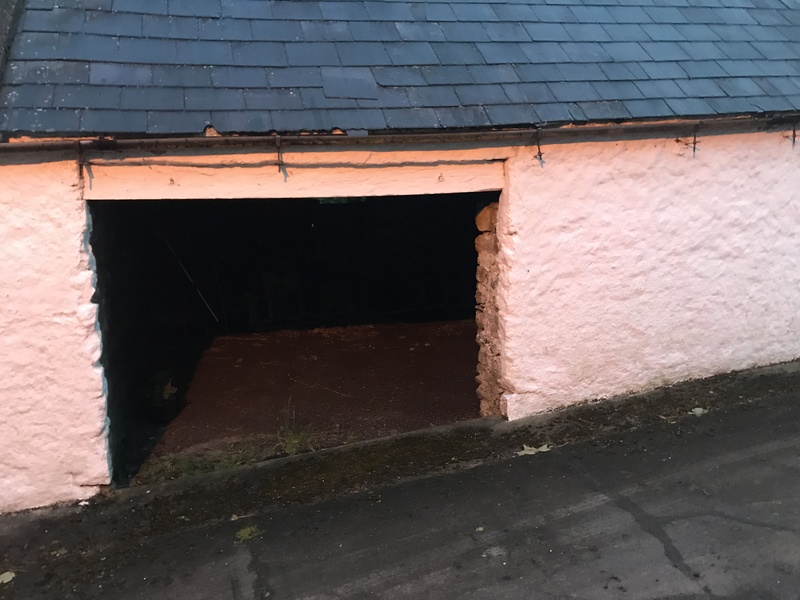 An empty peat store, sheltered from the wind and rain presented itself. There wasn’t standing headroom but it was warm and dry with the promise of a great view in the morning. 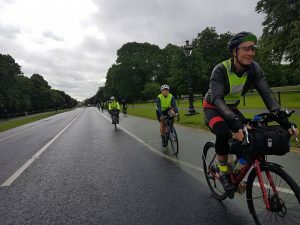 Day 4 and destination Galway 369km. 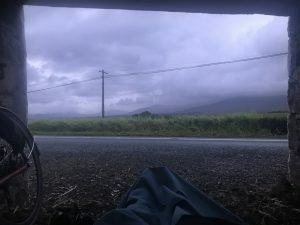 At 05:00 I emerged from my comfy bivi cocoon and braced myself for what I knew was to be a wild day of weather. Interestingly it seemed I did not actually need to set an alarm at night (though I continued to do so) as I always awoke feeling ready to go before it went off. My sense is that this race had me tapping into some primal archetype hidden within my psyche. It was as if I was away out on a hunt to feed my family and that the pressure of survival had me operating at an enhanced rate. I could sleep more when the hunt was finished but right now I had to keep moving in order for us to survive, it wasn’t a struggle, it was an imperative. That may sound dramatic but it is certainly this added feeling of aliveness that will have me signing up for more of these adventures. I find it quite addictive. The Achill Island section of this race was brilliantly intense and something I’ll never forget. 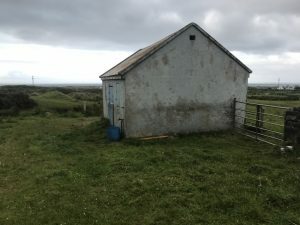 Gale force winds were blowing off the Atlantic from the southwest and accompanied by frequent squally rain showers. As I headed west away from my bivi spot I passed another rider sat in his bivi in a bus shelter accompanied by photographer James Robertson; I was treated to a pleasing round of applause! Soon after this I began to face the full force of the wind. 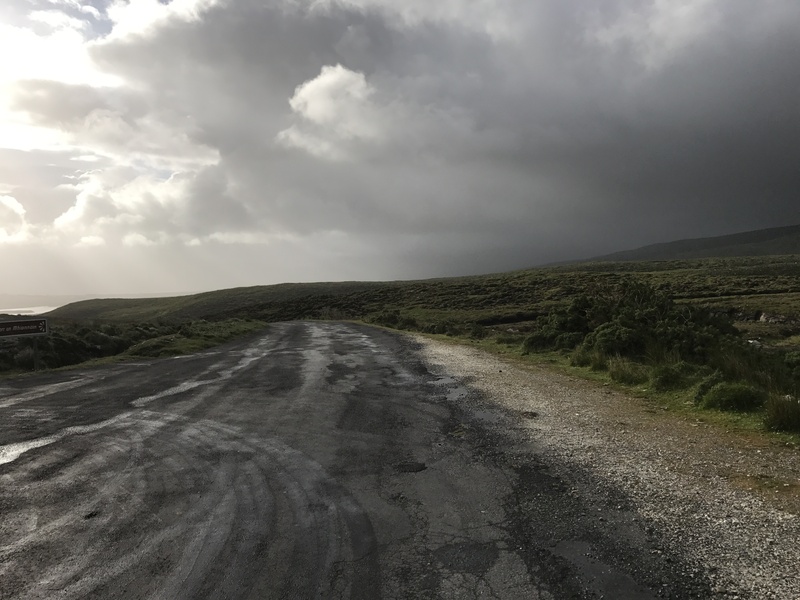 The route around Achill forms two loops and means that the impact of the winds you meet are continually changing. A headwind becomes, crosswind, tailwind, crosswind, tailwind, headwind with each presenting differing challenges and opportunities. I zoomed the map out on my gps so that I could anticipate these changes before they occurred. I found it helped me mentally to know when a headwind would shift to a more favourable angle. One of the maddest stretches was from Donega where I felt like I was leant at 45 degrees to counter the crosswind coming over the cliffs whilst also being showered in sea foam blown from far below. It was a crazy cycling roller coaster ride that had me laughing manically as some gusts virtually stopped me in my tracks. To add to the ridiculousness of the weather conditions there were the sheep. Sheep; what bizarre creatures they are. They appear possessed with the irrationally misguided notion that any action is preferable to no action, whenever, it actually isn’t! Therefore, when surprised by an approaching cyclist, this call to action naturally includes jumping directly in front of said cyclist. 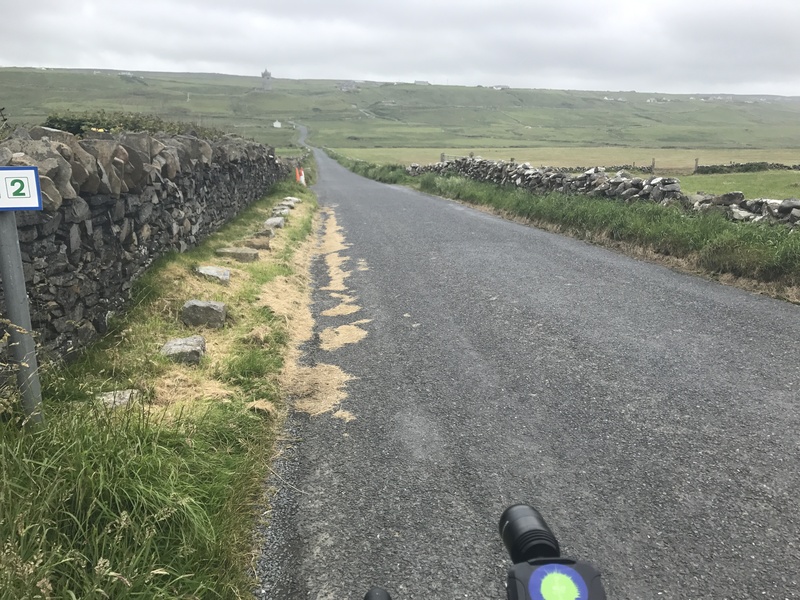 Such sheep antics were scaring me and slowing my descents and so, for additional personal entertainment and hopefully safety, I resorted to heckling them loudly from a distance. “Oi Shaun, come on mate, sort out the flock!” ,”Coming through! Prepare to panic!”, “Keep calm, keep grazing! '” and anything else that came to mind. It seemed to help and I at least felt proactive. 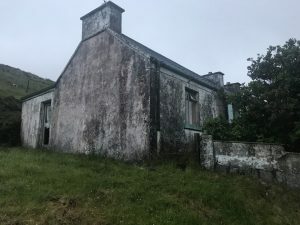 The Wild Atlantic Way challenges and delights in equal measure. I made it off the island shortly before 09:00 as several others were were battling into the headwind to make their tortuous circuits. At this point in time I was lying 6th! A top 10 placing was looking ever more achievable, who’d have thought! I’d earn’t my breakfast and pulled into a petrol station deli in Mulranny to eat, a freshen up and a re-stock. Charlotte Thompson pulled in soon after along with photographer James. James was clearly just enjoying himself watching us suffer whilst Charlotte was frustrated by established saddle sore problems. Having enjoyed a remarkably good coffee, filled my face with whatever seemed to have the most nutrient dense calories and loaded up on enough supplies to get me through another 150km+ it was time for the off again. I rode briefly with Charlotte out of town but then set off ahead to bag some more distance. Galway was still a long way off. It remained very windy and I kept to my tactic of tracking the approaching wind angles by having the route well zoomed out on my Wahoo Element GPS unit. I indulged in a generous early kebab dinner in Letterfrack at around 17:00 before carrying on until the early hours. 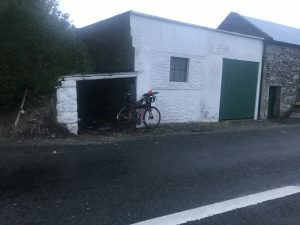 I was done for the day and whilst I hadn’t quite made my ambitious Galway target I had managed 339km at a respectable 19.5kph, considering the conditions. 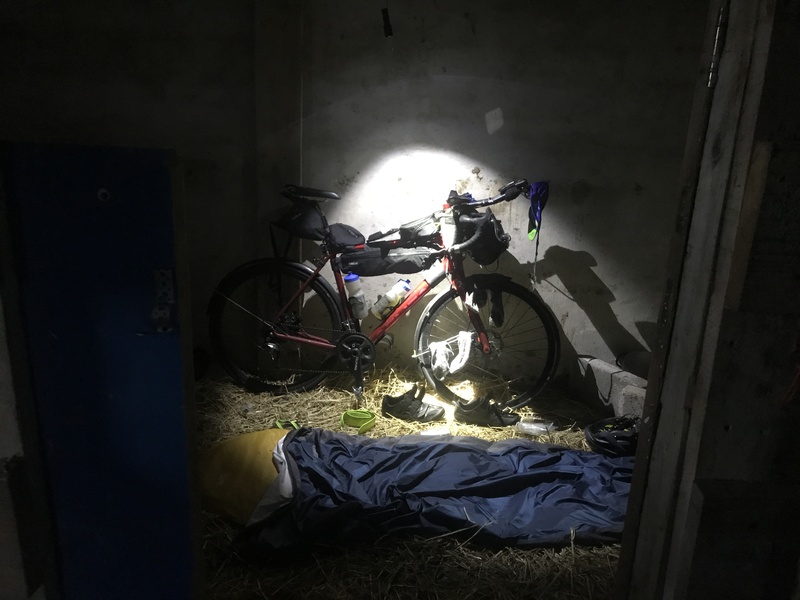 That night’s bivi was a small but luxurious straw lined barn. 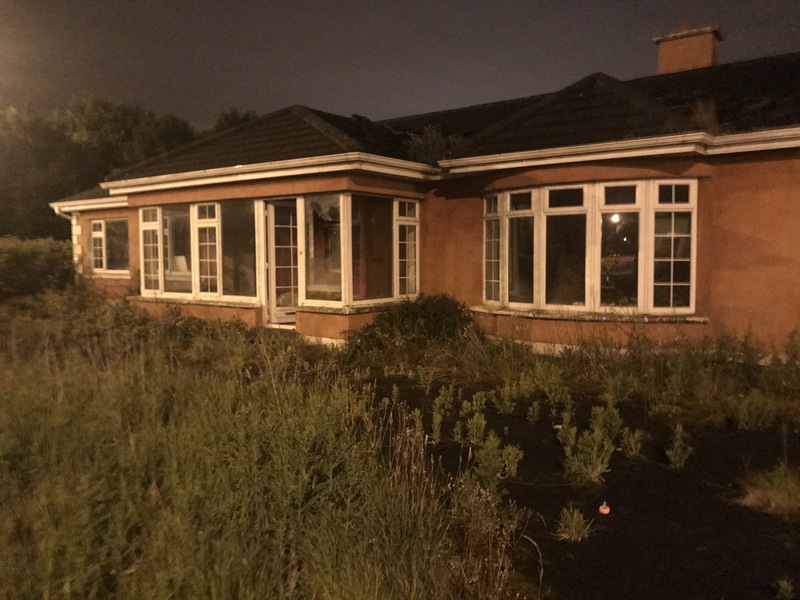 Unfortunately it felt like I was trespassing as the building was obviously still in regular use but at gone 01:30 and after a long, tough, weather beaten day I wasn’t really concerned. The warm calm was such a welcome relief. Day 5 and destination Ballybunion 356km. It was a relatively late 06:15 before I set off again and with the rest of the pack closing in behind there could be no let up. The wind had eased somewhat as I headed to Galway for breakfast and supplies. I had been in a somewhat unbelievable 4th place as I slept and this is when I felt the race was getting serious. The fast and musketeer-ily dashing looking Ales Zavoral had passed me before I awoke so I was now 5th. I began checking Trackleaders more frequently. Gerald, James, Paul and Charles were all chasing me down. I couldn’t be sure how illusionary this 5th position was in relation to rest stops but let’s just consider the possibility that I might be doing very well indeed and carry on that way. The leaders, Bjorn, Bernd and Luke were in a race of their own but the hunt for the following 7 placings was to be close run. I had to balance my needs for rest and fuel with the imperative of simply keeping moving. 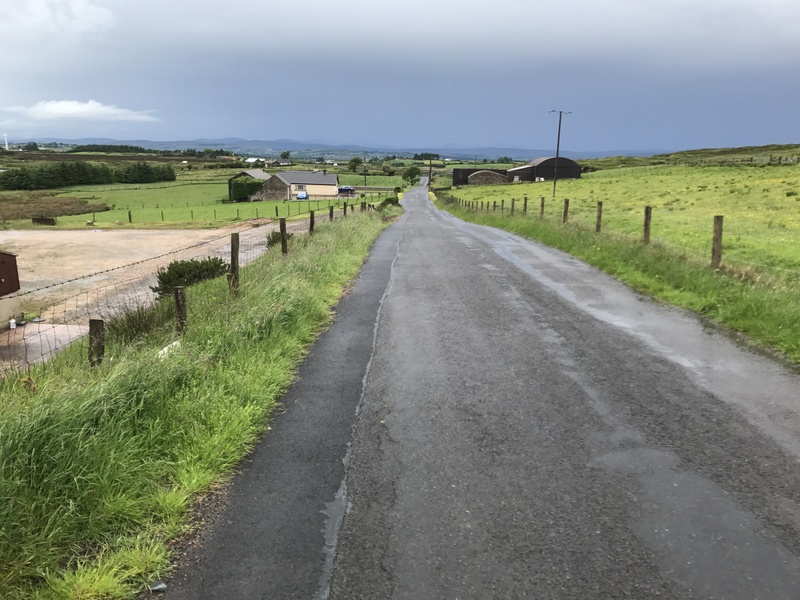 It was drier and less breezy today but also the last day of the relatively flatter terrain and I knew that the approaching hills would mean the pack bunching up again as the riders behind caught up. I pressed on to Kilrush and stopped at around 17:00 for an early mega dinner of kebab and fish and chips. Fast food full of, protein, fat, carbs and hopefully micronutrients. It was an interesting stop as the shop was busy with loud, bored teenagers. Across the room there was one other customer looking a little uncomfortable amidst this youthful exuberance; I sent her what I hoped was a reassuring smile, rather than a creepy grimace. It must have worked because she came over and asked if she could sit with me as the youths were making her feel uncomfortable. I agreed but warned her that I might not be very talkative as I had to text home, check the race tracker and devour a lot of food. She was very accommodating and we exchanged stories between my ungentlemanly guzzled mouthfuls of food. She was from Kilrush and writing a book about the town but far more interested in this crazy race of mine than talking about her book. The youths were still as loud, boisterous and bored looking as ever and clearly not helping her feel at ease and she soon said her goodbyes and wished me well. As I left one of the lads asked me what I was doing, so I explained the race and set them Googling the event, “Good luck, fair play to you..” was the response. 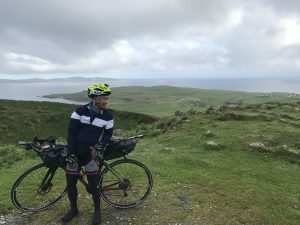 I like the idea that an event like the TAWR can bring people together and inspire others through chance encounters such as this and who knows maybe even one of these youngsters decided to dig an old bike out and go explore the beautiful country they live in. Once on my way again the fish and chips had me feeling sluggish and it took me awhile to get back up to speed. Ballybunion was too far off for this night shift and so I settled for a target of a few hours sleep at Limerick and hoped that the riders behind would do the same. 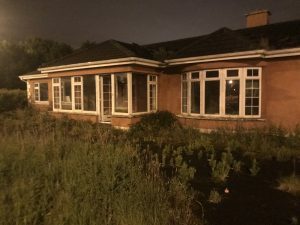 I’d been enjoying my old house and barn find bivi spots up until now but with Limerick being a city I thought I might have to settle for something more utilitarian such as a porch or bus shelter for extra cover but as luck would have it I found another derelict house just off the main route. 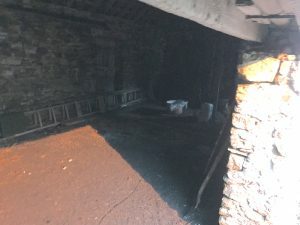 This place was horrid with soggy damp smelling insulation and broken glass strewn all over the floors. It was manky indeed but a bit of exploring lead me to a relatively untouched room with a cleanish wooden floor and intact windows. I carried my bike in to avoid any risk of punctures. My body clock had me awake again a couple of hours later so I was back on the road at around 02:00 and gladdened to see that my pursuers were also stopped. Ballybunion for breakfast then! Day 6 and destination Portmaggee 400km. (Portmagge being the destination according to my original, ambitious, pre-race planning.) This was the day that things started getting ragged for me. We were back into hilly terrain now and more atrocious weather was forecasted. I made it to the Connor Pass by early afternoon and still in 5th but Dan Massie was closing in fast. The Connor Pass was quite emotional for me. I pushed up slow, steady and non stop but felt tearful at the top because I had a tangible sense of the late Mike Hall standing next to me grinning! Fanciful maybe but I also felt encouraged. I think it was this descent down to Dingle when I first noticed that all was not right with my neck. I like to descend holding the drops with the brakes covered by my finger tips for maximum control and security. This was a long descent and I think it was here when I first found it necessary to sit more upright and hold the hoods instead. I had no neck pain or knotted muscles, it was just fatigue. During early pre-race training time spent on the aero bars had given me neck aches, pains and sometimes headaches but with practice and regular stretching these issues had receded. Evidently my neck was still not strong enough for the massive demands of a race such as this. A few other niggles were making their presence known as well. I’d had a muscle pain a little below the back of my knee in my left calf for a day or so and this had now become more painful and shifted up to my lower hamstring just above the back of my knee. It did not seem to hinder my riding much but was increasingly unpleasant off the bike and no amount of stretching was easing it much. Other than that I had mild saddle sores and gentle knee aches at the start of each ride that would clear once I was warmed up. So no great dramas all things considered. Dan Massie duly past me whilst I was stopped to eat in Dingle but once the loop around the Dingle peninsular was completed there was to be a splendid run east with a stiff tailwind that might help me gain some ground. Not so long after this I made my first big mistake and missed a turning. I’m using a Wahoo Elemnt bike computer and it will flash red LEDs at you and make warning beeps when you go of course but I somehow managed to miss this and only notice that something was wrong when the screen stopped displaying the “distance remaining” field that I have setup. I know from experience that this happens if you go of course but it took me ages to finally twig that this was what had happened. I had to double back to rejoin the route. The whole escapade wasted hour whilst allowing Charles Batho and those further behind to gain 20 or so km. Doh! My challenges did not end there however. 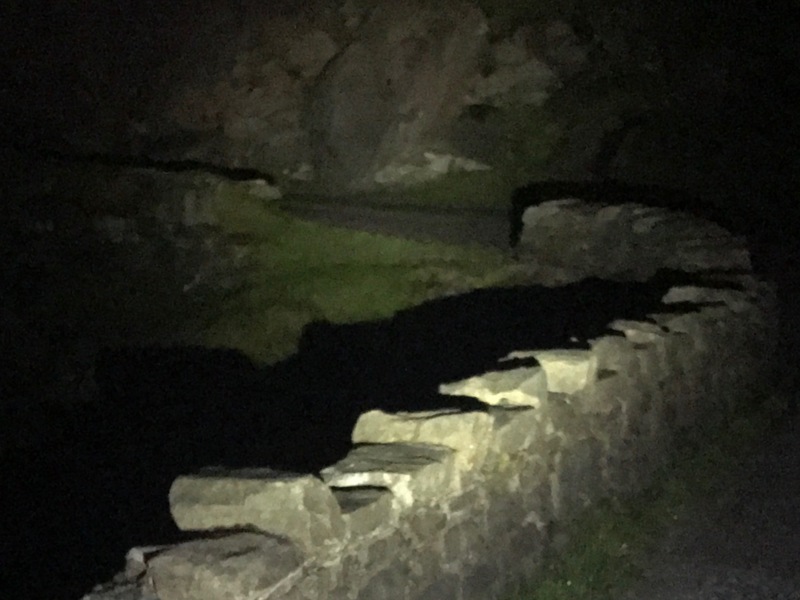 Next up was the Gap of Dunloe, in the dark, and this went horribly wrong. It’s a narrow, steep, winding climb with constantly changing gradients. In my fatigued state, in the dark, with weakened neck, and bar end shifter gearing I was finding it impossible to anticipate the gradients and make my gear changes correctly. I’d either be fighting too high a gear or doing that hideous thing with too low a gear, where you seem to pedal air. Before long, I duly fell off… It wasn’t a bad fall but somehow my chain came off and managed to lodge itself between the crank and the chain spotter installed to prevent this very thing happening! Ho hum…out with the tools. Once fixed I went for one more attempt and failed miserably again, this time falling onto a hard rock wall. Remarkably I suffered only a small cut and bruised hip but recognising that this could have turned out so very much worse I opted to bivi down and wait for daylight. This meant walking back down hill to find somewhere sheltered from the wind. I found a small spot behind a large rock and was soon asleep but aware that lying on my left side was a lot less than comfortable. It was a little after midnight. 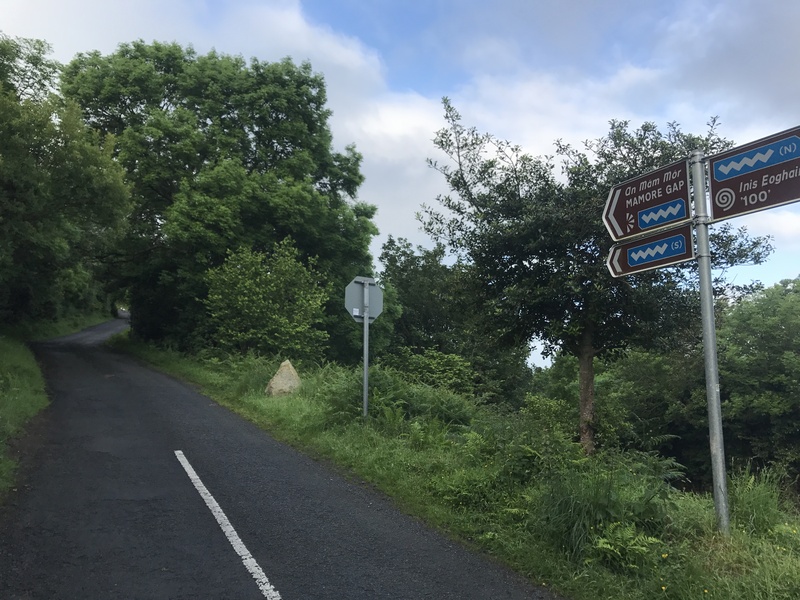 Day 7 through 8 the Ring of Kerry and final abandonment 380km. I was up and on the road again at first light (again thanks to my body clock) and in good spirits though a little sore. I still wasn’t overly aware of neck issues either and recorded this rambling FB Live video. This was the toughest day yet for me with strong winds, driving rain and challenging climbs. I was now in 6th with Paul Alderson having passed me by in the night. This was to be the final push to the finish with little opportunity for serious rest. 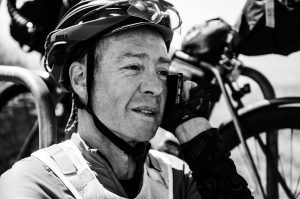 I recall surprisingly little about this day beyond the relentless challenge of wind and hills and an increasing awareness of those behind closing in. Descents were certainly becoming slower and more difficult with my neck increasingly refusing to hold my head up for any length of time.To counter this I rode sitting as upright as possible using my aero bar pads for hand grips. Riding up the Ballaghbeama Gap after Glencar was quite memorable with the return of very heavy rain and wind. I was fairly happy about this having convinced myself that it gave me an advantage. You see, I’ve been an avid windsurfer for decades and so wind and rain are a natural feature of my playground and not usually something to be cursed. At some stage this day I’d also hit upon the idea of cable tying the back of my helmet to my hi-viz vest in an effort to get extra neck support and initially it helped. It was here that the dry humoured Ben Holme materialised, unexpectedly and at speed. As I was walking part of the hill to ease body and neck. He rolled up, cursed the weather, mentioned something about a breakdown and then sped off up the hill only to also start walking soon after. This all seemed a little surreal as it was so unexpected. I hadn’t checked the tracker in awhile anyway but at that point I didn’t recall a “BH” being close. This wasn’t a morale booster as it meant I’d dropped another place. 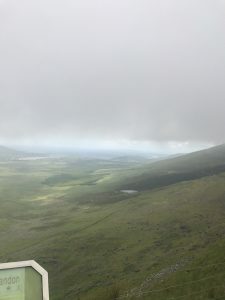 For now though I peddled past his trudging form and made the scary descent towards Kenmare mostly holding my elbow pads. Ben shot past soon after; oh well… I needed to, eat, dry out, warm up and rest. I made it to Kenmare for dinner by 21:00 and dived into another welcoming kebab shop. This was some 210km on from my 04:00am days start. 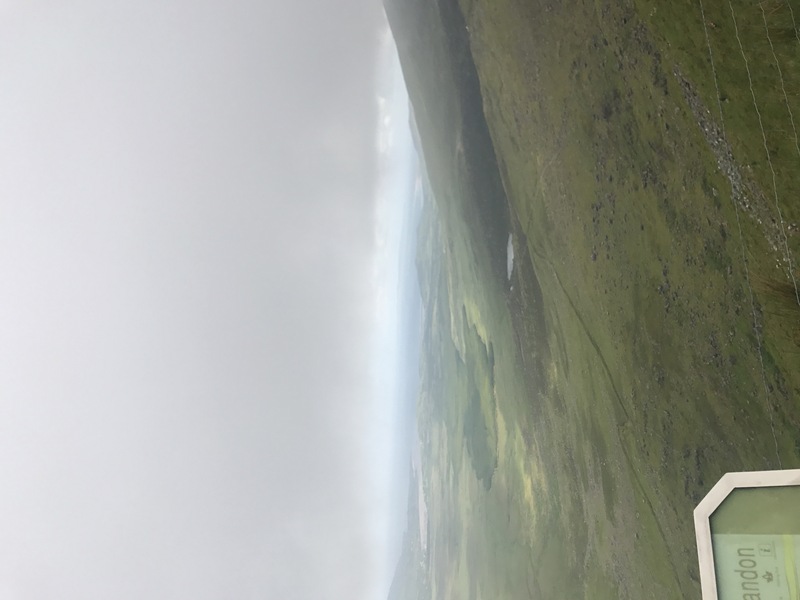 I retired upstairs with my two kebabs and checked the tracker; young Ben Holme seemed to have headed off in the wrong direction… The pack that had been closing in on me were now severely slowed by the challenges of the Ring Of Kerry and I was in 7th just behind Paul Alderson. Top ten still achievable! I’d downed both kebabs and decided that a third was required and whilst that was being prepared I head for the bathroom hand dryer to dry my socks and gloves. I spent most of this event damp from either rain or sweat but with warm when wet merino base layers plus leg and arm warmers and with a hooded down jacket to wear when stopped it was never a problem. 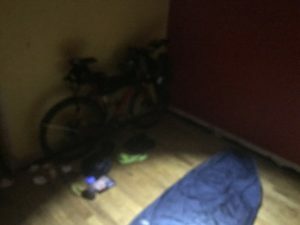 On the wettest nights I had a second dry merino base layer and a pair of polartec leggings to sleep in whilst the down jacket also doubled as a sleeping bag. Putting the cold damp riding clothing back on wasn’t great but it soon warmed up. I always intended to avoid B&B’s and just bivi if at all possible. I enjoy that and it makes the whole event feel more self supported and a greater change from normal life. Essential cleanliness can be managed with wet wipes and bathroom stops but in order to enhance a sense of freshness I make a point of shaving daily. Clean teeth and a shave work wonders! My antics in the bathroom were broken with the arrival of the media crew with Breifne conducting a short interview and Jennifer snapping a few shots. My third kebab arrived and they left to pursue other riders. 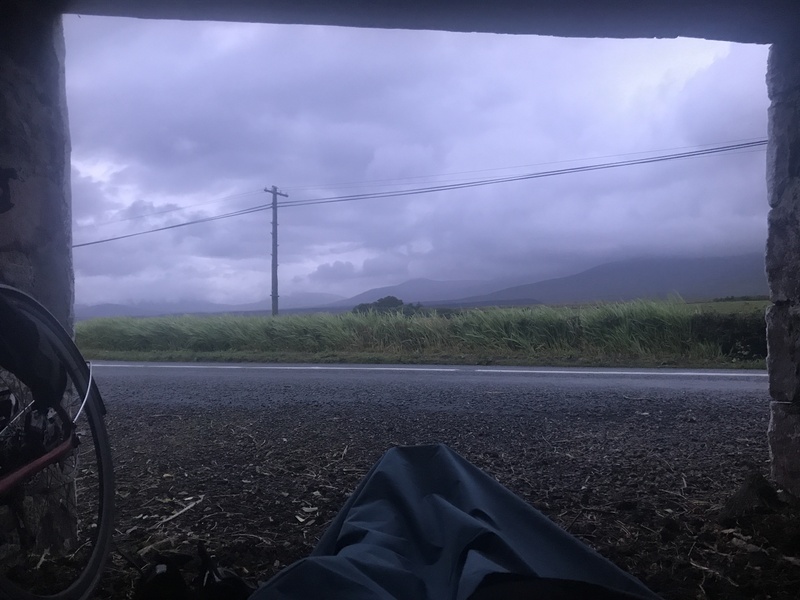 I ate the kebab and then lay down on a bench for a power nap as I wasn’t planning anymore full bivi stops. I was going to make it to the finish on more frequent shorter naps so that I could keep moving and maintain a tactical eye on my competitors positions. Kenmare to the finish is about 430km, less than 24 hours riding away. I could just be at the Blarney Castle Hotel, quaffing Guinness, before closing time tomorrow! It turned out that I was but for the wrong reasons. I knew none of this as I left Kenmare just after 23:00. I was planning this as my last full night on the road and decided to celebrate by listening to my “emergency playlist“. I’m not one for music or headphones whilst riding as I prefer the sensory stream from the sounds of the world around me and don’t feel safe cutting myself off from that awareness of traffic etcetera. At night however traffic can be gauged from the approach of headlights and makes my hearing less critical. My playlist is an eclectic mix of tracks that stimulate me either to keep going or simply make me laugh. The rain had passed and a warmer, starlit, night was unfolding as I peddled off towards the finish hooting like a bandit whilst listening to Chingon playing Malaguena Salerosa. In truth I was probably a little delirious but who cared, I was joyfully content; hooning through the night with my wobbly head. 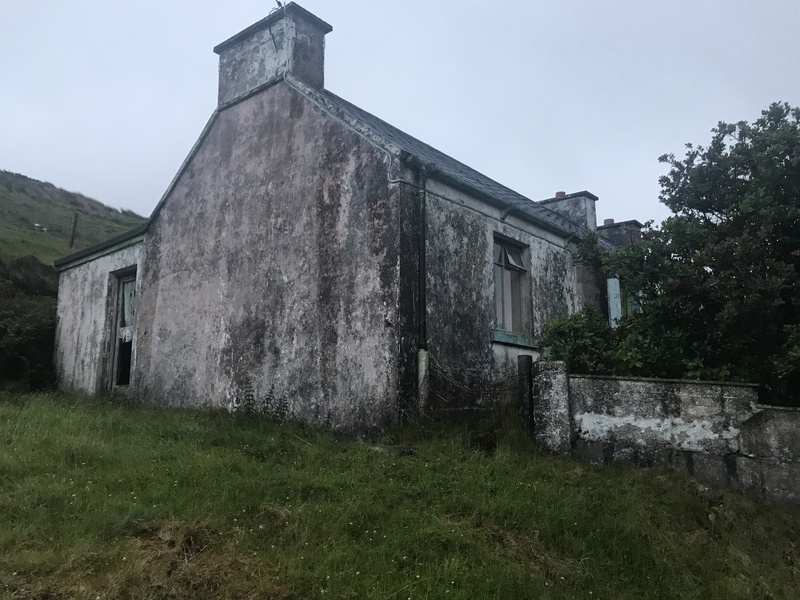 I’d made another mistake in Kenmare in that I’d missed a shopping opportunity and didn’t have enough food and fluids to see me properly through to opening time the next day so, come dawn, I was slowed by the need to find water. I lost time scouting several houses for outside taps before finally finding success behind a pub in Allihies that also had a covered outside seating area that was perfect for a nap. James Dennis was tailing me but I reckoned I could have myself a restorative half an hour in relatively safety. James and I passed one another, unseen, in opposite directions as I left Lambs Head. The road now ran eastward with a following wind so I pushed on as hard as I dared in the hope of gaining more distance on my pursuers. Everything was becoming tougher now, with my neck increasingly weaker and my hands numb and tingling due the the hammering they were getting as a result of using the elbow pads as grips. A refuelling stop and tracker check at Glengariff showed that I had gained some but also revealed that the speedy Paul Alderson was moving up the ranks. Paul was following a strategy of getting decent sleeps and then making rapid progress that seemed to be working very well for him. The day blossomed into one of lighter breezes with longer spells of warm sunshine and it seemed entirely possible that I could hold my 7th place right till the finish. I was in denial however and stopping or walking to rest my neck increasingly often. While my descents were, on reflection, actually quite dangerous. Still, I don’t think scratching had even crossed my mind at this point as I was so fixated upon the task at hand. I found the seemingly relentless Sheep’s Head climb out of Bantry towards Kilchrohane very tough as I just couldn’t hold my head up or hold my handlebars properly. I eventually made it to the top and eyed the next descent with some misgiving. Moments later media man Breifne arrived with word that event organiser Adrian O’Sullivan wanted to talk to me. Er oh… Breifne passed me the phone. Photographer, Jennifer Doohan, captured the memorable moment. Adrian had heard about my neck and was concerned. It was within that moment that good sense returned and I absolutely knew in myself that my race had to end. I’d promised my family that I’d stay safe and I felt a responsibility to them, myself, Adrian, the public and other road users to hold to that. If you cannot hold your head up to ride your bike and see properly, then you simply should not be on the road. Reality had hit but I certainly didn’t feel that I’d failed or lost the race. My week had been triumphant. I’d exceeded all my expectations and thoroughly enjoyed myself in the process. My neck could easily be strengthened in time for the next event whenever the maybe. Ultra endurance cycle racing could count on me returning for more adventures. Breifne recorded an interview with me in somewhat impassioned form soon after I spoke with Adrian. So ended my 2017 TAWR campaign, less than 270km from the finish. Roll on 2018! 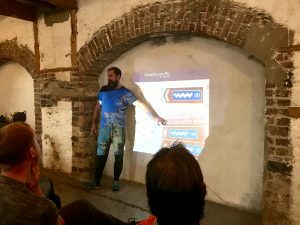 Do take a look at The Transatlantic Way Race Facebook page for more insight into the race and excellent photos, videos. and interviews with the other riders. The race tracker is fascinating and can be replayed here. Finally, please consider making a donation to my Just Giving appeal in support of Age UK.